Identification: This species has blunt tubercles decorated with low papillae. There is an irregular white line running along the midline of the notum from the rhinophores to the branchia. 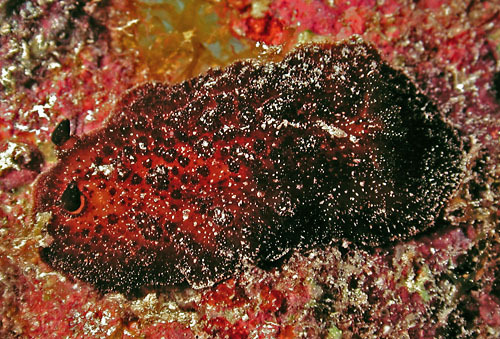 Natural history: Atagema intecta is a rare dorid known from only a few animals. It is found in shallow, rocky habitats. Distribution: Big Island, Oahu, Pearl & Hermes Reef and Midway: widely distributed in the Indo-Pacific. Taxonomic notes: It was first recorded in Hawaii at Fort Kam Reef, Oahu by Scott Johnson on Oct. 16, 1977 and is referred to in some sources as Trippa intecta. Photo: PF: Midway; June, 1993.